It’s hard to truly make it in any industry without being successfully represented online. Sometimes, this is a hit or miss, but with the proper guidance you can easily stand out from the crowd. If you want to build a powerful business and win new clients you need to choose the perfect theme. The themes on this list are the most popular and overall best WordPress insurance themes out there. All of them are designed and built to function as an outstanding platform for crafting successful websites, no matter the niche. They have modern, professional, and elegant designs along with engaging and intuitive features. 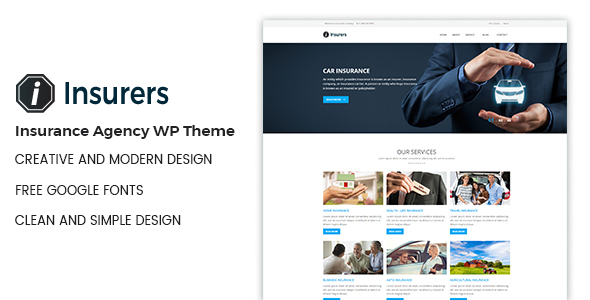 Starting with one the best WordPress insurance themes - Insurance is an elegant, serious, flexible, eye-catching, pure, and visually stunning theme. This theme was built to meet and exceed the needs of insurance agencies and insurance agents. Insurance has a full responsive design that adapts to any screen resolution and mobile devices. Your audience will have no trouble using your website regardless of the platform used. Some of the features that come with this theme are 150 shortcodes, unique homepage design, beautiful inner page layouts, 4 premium plugins, store locator, and appointment form. This is one of the best-selling WordPress themes on the Envato market thanks to its impressive features, versatility, and speed. No matter the niche, industry, or field Bridge is there for you. Bridge comes with a bunch of useful tools from the 200 beautifully designed demos, extensive documentation for beginners, tons of fonts and colors, and potent theme admin panel to a completely responsive layout, and more than 500 shortcodes and features to design something unique. 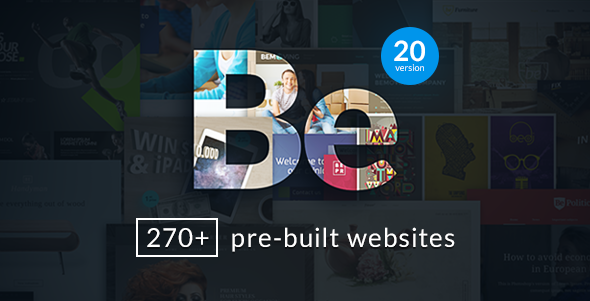 BeTheme is a very popular multi-purpose WordPress theme coming with an almost perfect rating. This theme includes an impressive 270 pre-designed demos, so it fits any type of website regardless of the vision and style. BeTheme packs an amazing number of features such as an easy installation, premium plugins, Muffin builder 3, slide side menu, minimal mobile header, 6 layouts, header styles, powerful admin panel, and others. Stop questioning it and give it a go! Saifway is the perfect choice for insurance companies. It is a gorgeous, robust, outstanding, reliable, and versatile WordPress insurance theme that will surely give you the extra edge over your competition. No matter your technical background, Saifway will help you build a successful website. The theme takes seconds to install, and afterwards you can choose one of the pre-built demos to get you going. 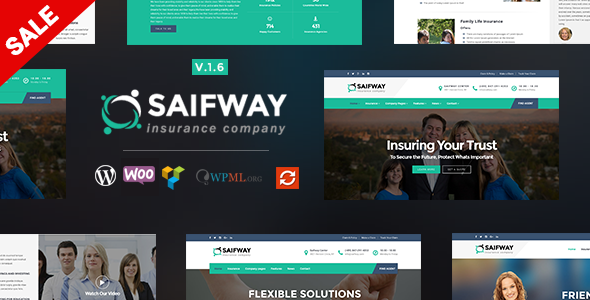 Some of Saifway’s features are 3 header styles, 2 powerful plugins, WooCommerce support, WPML support, custom shortcodes, insurance post type, child theme, Google fonts, contact page layout, news page layouts, and more. Get started with Saifway! 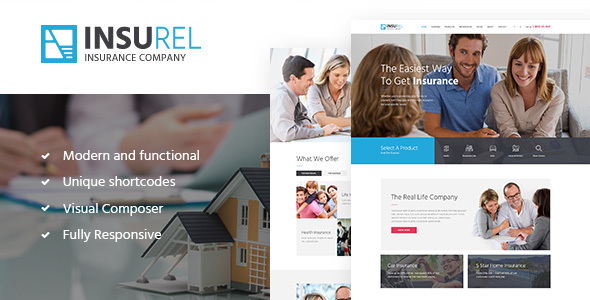 InsuRel is a beautiful, highly customizable, reliable, professional, responsive insurance WordPress theme. It can be used to develop websites for insurance agencies, law companies, finance advisors, accountants, and lawyers. InsuRel works perfectly on desktops and does not present any issues with mobile devices. Regardless of the device or platform used, InsuRel will look great. InsuRel includes a large spectrum of theme features among which are easy installation and demo content import, drag and drop page builder, SEO optimized code, multipage layout, tons of shortcodes, sticky menu, Google Map, parallax effect, and Google fonts. One of the most powerful WordPress insurance themes! Insurance Agency is an uncluttered, user-friendly, professional, serious, premium WordPress insurance theme. With this theme you can easily highlight your services and products and be in full control of your online business. Insurance Agency is deeply customizable and includes 2 homepage layouts, mobile devices customization, visual composer drag and drop page builder, Revolution slider, shortcode builder, WooCommerce, free updates, media content manager, and a few others. Take advantage of these incredible, advanced technologies and grow your business. 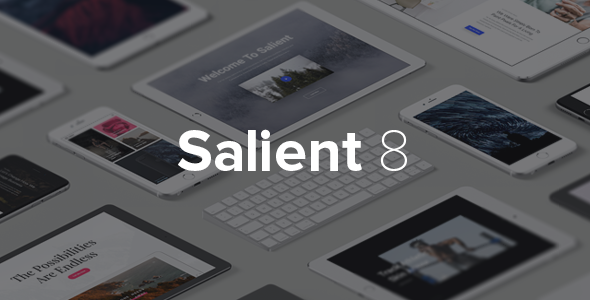 Salient is a stunning, unique, creative, responsive premium WordPress theme fit for any insurance related website. It is highly customizable and intuitive. This premium multipurpose theme includes more than 150 fully built website designs, losts of shortcodes, tons of icons, unlimited color panel, 700 font options, several header styles, and 5 blog layouts. Salient is the ideal choice if you are searching for a great WordPress theme that will allow easy customization. Definitely one of the best WordPress insurance themes out there. This next theme is a flexible multipurpose WordPress theme suited perfectly for insurance websites. With Kallyas you will get a large collection of pre-designed homepages and demos. Kallyas includes features like a live text editor, Visual builder, 100 design elements, premium slider, timeline layers, video documentation, and many others. You cannot go wrong with Kallyas! Try it today. Designed and developing unique websites has never been easier than it is with this theme. Jevelin is a multipurpose, responsive, stunning, creative, reliable, and versatile WordPress theme perfectly adaptable to any business and company. Jevelin comes bundled with Revolution Slider and Unyson Drag and Drop page builder making it even harder to resist. With Jevelin you will no longer have to worry about rankings because it is optimized for SEO purposes. Check out the demo preview! ChainBit is a beautiful and unique theme that can be used for various purposes. It comes with a stunning layout perfectly adaptable to mobile devices. This premium theme was built using Elementor as page builder which makes it responsive and easy to customize. All the images included in the demo are completely free and the theme includes a book appointment system free of charge. Check it out! Mist is a relevant, potent, robust, reliable, impressive, and elegant WordPress theme. This theme is very creative and versatile and will serve as a great platform for any insurance agency and agent. With Mist you get over 500 pre-made demo pages, 50 homepage demos, various premium plugins, over 50 unique templates, 24/6 support, video tutorials, advanced admin panel, light and dark skins, forms, events calendar, unlimited widgets and sidebars, and WPML and RTL ready. Try it now! Using TradeBit WordPress theme, you can establish a professional and reliable presentation for your cryptocurrency business website. The fully responsive layout of the theme comes loaded with a bunch of ready-made pages that are suited to be applied for a variety of occasions. The theme is flexible enough in order to be modified in accordance with your business needs. Elementor page builder makes it quick and intuitive to apply all necessary changes to the theme using a drag-and-drop dashboard. In addition to getting a premium-quality web design, the theme's download will provide you with free access to the high-quality images and premium plugins. 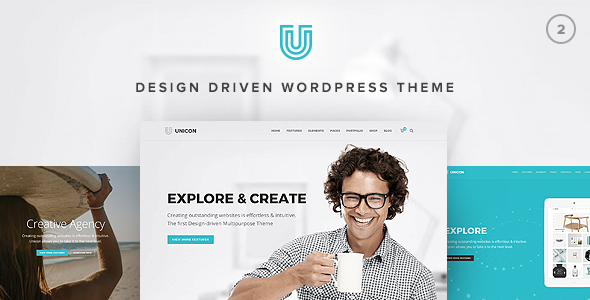 Unicon is a stunning, wonderful, powerful, and pristine WordPress theme. It follows a simpler design than most popular themes, but this is a pro rather than a con. You can install Unicon in a couple of minutes and it comes with a gorgeous collection of pre-built demos you can choose from. Additionally, it also includes Visual composer which can be used for designing impressive layouts for each page. The theme’s admin panel comes in handy to customize the theme further and make it your own. MineBit is a ready-to-go solution that will help you build usable and feature-rich cryptocurrency and ICO sites. The theme contains 5 pre-designed demos, which gives you the freedom to select the best design for your future website. The theme is built with the mobile-first paradigm, making all pieces of your site's content look stunning on small and large screens. Elementor page builder, Jet plugins, and a pack of premium images are included in the theme's download package. 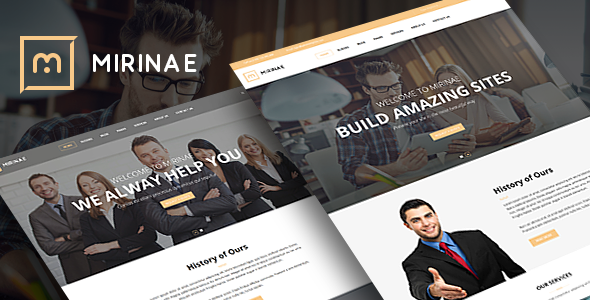 VG Mirinae is a beautifully constructed, clean, responsive, professional, premium insurance agency WordPress theme. This is one of the best themes for insurance agencies, insurance groups, brokers, or any other business or companies in this niche. VG Mirinae incorporates full WPML support, responsive layout, Visual composer, RTL support, SEO optimized code, unique demo layouts, Mega menu, Slider revolution, VG PostCarousel, unlimited colors, Google fonts, live customizer, and so on. With VG Mirinae creating a website is easier than ever before! This collection featuring the best WordPress insurance themes would be incomplete without VG Mirinae. Insurers is an appealing, attractive, flexible, and modern theme ideal for insurance agencies, brokers, insurance agents, financial businesses, startups, and more. With this theme you can showcase your products and sell them as well. Insurers comes with an amazing page builder, various page layouts, unlimited colors, intuitive theme admin panel, WooCommerce ready, point and click interface, unique design bar, live customizer, custom widgets, and Google font integration. You can count on this theme to help you create a successful website in no time! 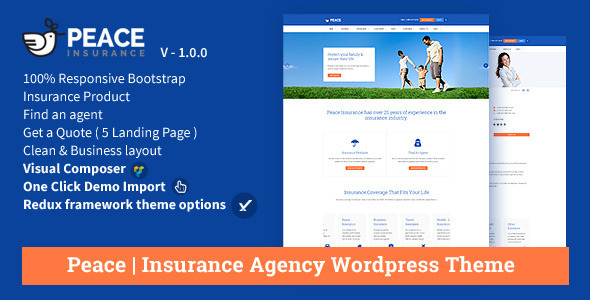 Insurance is a clean, professional, pristine, eye-catching, feature-rich WordPress insurance theme. It was developed to fit various insurance and finance related businesses. Insurance comes with a fully responsive layout that resizes and adapts perfectly to any device. It also includes an integrated drag and drop page builder, a couple of forms, unique sections, blog layouts, header background slider, and so on. Inside the theme’s admin panel you find all the customizable options available, which are not few. Try it today! 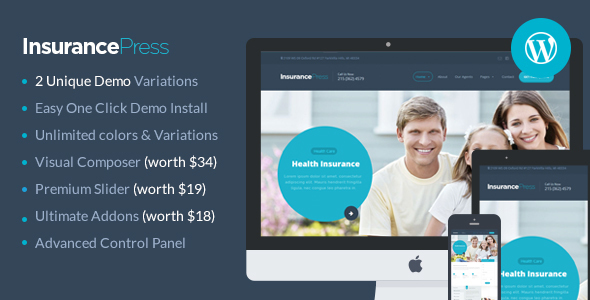 Insurance Press is a stylish, exceptional, stunning, responsive, and smooth Wordpress theme. This premium theme will offer you the possibility of crafting an elegant website for your company. Instantly grab the attention of your audience and visitors and highlight your services with Insurance Press’s engaging design. This theme includes a bunch of handy features among which are unique demo layouts, unlimited colors, Visual Composer, Premium Slider, Ultimate Addons, Google fonts, multiple page templates, free support and updates. 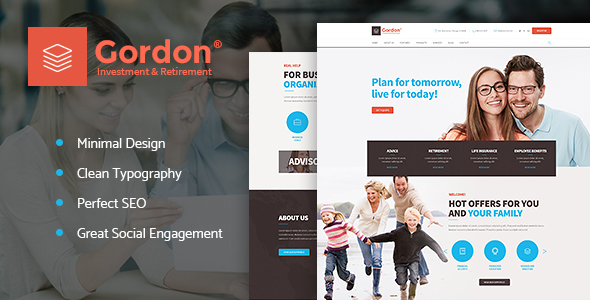 Gordon is a sleek, simple, easy to use, modern, and appealing responsive WordPress theme for insurance agencies. With Gordon you can have a complete website with just a few tweaks here and there. This theme has 2 premium sliders included, several layout features, navigation options, Visual Composer, compatible with most popular plugins, custom widget set, lots of shortcodes, Google fonts, and one-click demo install. Take it to the next step with Gordon! 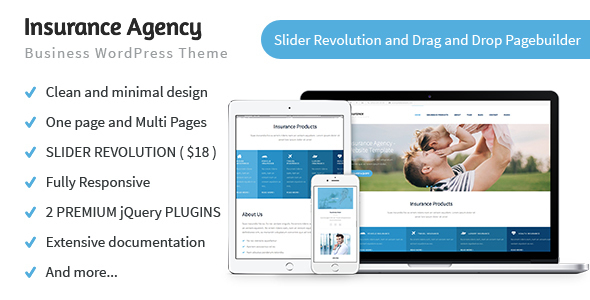 Insurance Agency is a beautiful, powerful, highly customizable, intuitive, and attractive insurance agency WordPress theme. Its design and features will make your website stand out from the crowd and leave good first impressions. Insurance Agency comes bundled with Slider Revolution, Isotope JS Gallery, Flickity JS Slider, which saves you $70. A few of this theme’s customization options are one page and multipage layouts, unique shortcodes, 3 predefined color skins, translation ready, child theme included, and options for logo and sections. 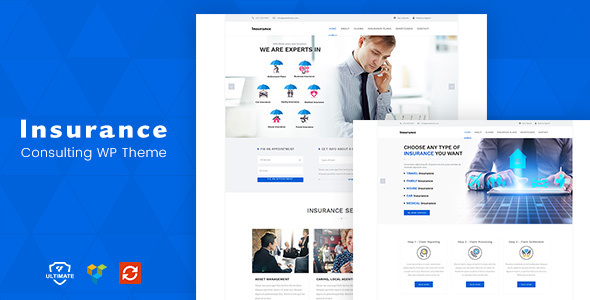 Insuranced is a reliable, resourceful, effective, powerful, intuitive, and responsive insurance agency WordPress theme. Insuranced provides a wide range of features and tools to create professional and elegant websites. Insuranced comes with an advanced quote wizard, a quote pop-up, several homepage layouts, Visual composer drag and drop builder, informative pop-up, pricing tables, Revolution slider, and helpful support. Give Insuranced a try today! If your goal is to build a successful and unique insurance related website, then take a look at this theme. Peace is a professional and modern website that accommodates any vision and style, and will also adjust correctly according to the screen size it’s viewed on. Peace includes Visual Composer, unlimited color palette, demo content, over 800 Google fonts, get a quote form, product landing pages, child theme, find an agent section, claim center, and more features. With Peace you can showcase only your most important information so your audience can find it more easily. 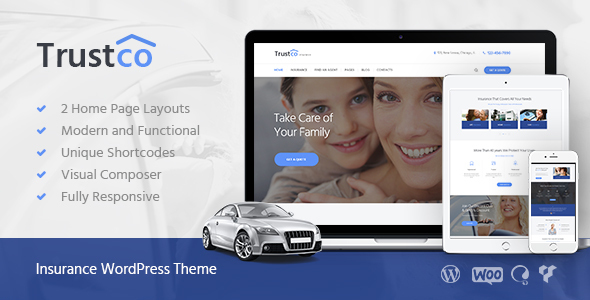 Peace is the insurance WordPress theme you need! 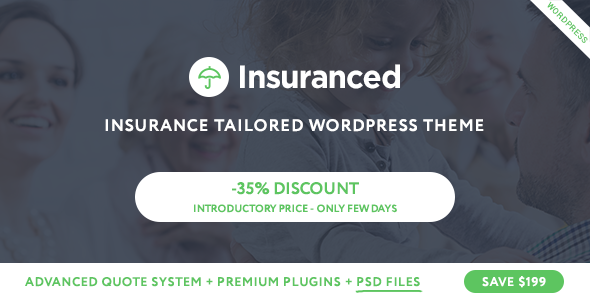 Last but not least, Insugroup is still part of the best WordPress insurance themes! It is a sleek, potent, flexible, and gorgeous WordPress theme that allows visitors to have a unique experience while browsing your website. This theme is easy to install, customize, and intuitive. 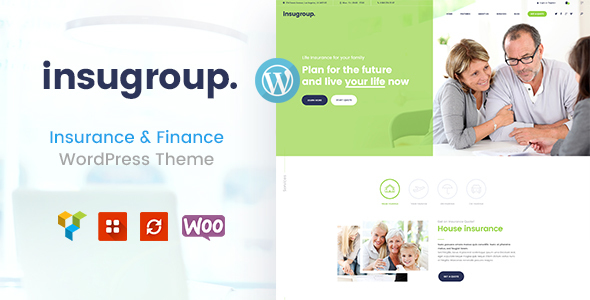 Insugroup comes with a bunch of impressive theme features including a fully responsive layout, an easy to use theme panel, 3 homepage styles, automatic updates, multi-language support, mega menu compatible, sticky menus, and powerful shortcodes. Additionally, this theme also comes with a detailed documentation and a dedicated support team always there for you. WordPress insurance themes are a great tool to have at your disposal especially if you are building an insurance related website. Your website will look amazing and will save money by choosing one of these themes instead of hiring developers to develop one from scratch.